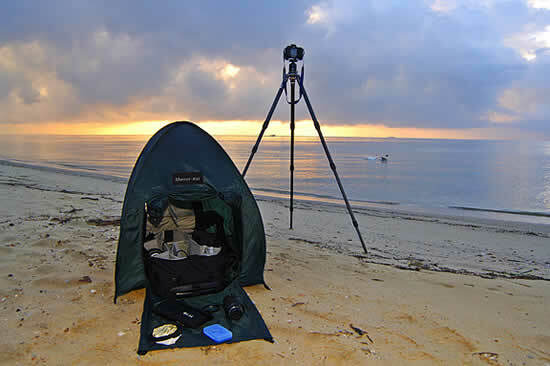 Think of the ShutterHut is a mini tent to house your equipment while you're shooting in less-than-ideal conditions. 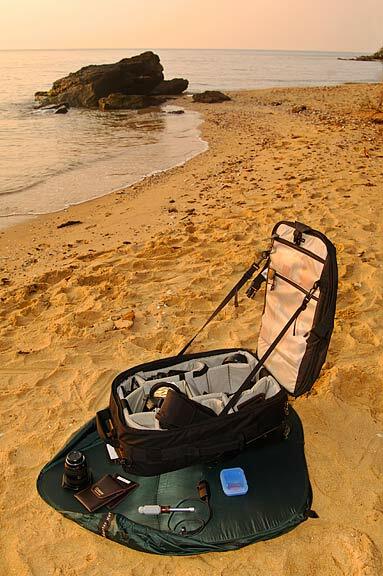 The ShutterHut is made of a durably waterproof nylon which will protect your gear from blowing sand, rain, snow, and harsh sunlight. The ShutterHut also includes a removable pouch for holding small items such as flash memory cards, film, batteries, and the included metal stakes. When finished, the Shutterhut folds flat to a 12" disc, similar to a reflector, and weighs only 1lb 3 ounces. A carrying bag with strap is included. Removable pouch for holding small items such as batteries, flash cards or film. Wraps into a 12" disc, weighs 1lb. 3oz. 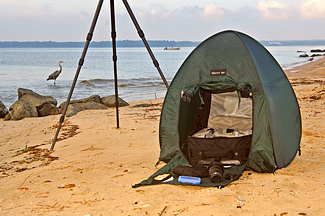 The ShutterHut also lays flat on the ground to protect camera gear from sand, dirt, mud and dampness. It is ideal for giving you a larger work area and quick access to those needed items. Seconds can make the difference in many shooting situations. Outdoor Portrait work can require a variety of shooting accessories and locations. 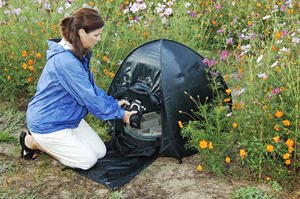 Use of the ShutterHut in public places gives you an enclosed tent for added security.